Julia Meade's 1958 Oscar party "invite" and "press release". 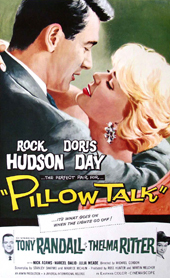 Julia and husband O. Worsham Rudd threw an Oscar party in their New York City apartment in 1958, the year that Pillow Talk was nominated for several Oscars. Ever the jokesters, they sent out an invite (above) along with a fake press release (also above) and accompaning photo (right). The location and time on the invite are correct, but the press release is totally fabricated. But an aisle-full of actors, pushing down from the rear. "Now, Piper, now Debbie! Now, Debra, now, Rock! You there, Bella Darvi, stop running amok!" "Wait, Rory, wait, Rusty! Please take your time, Tab! And Rex, use your reason, don't reach out and grab! Such impatient rudeness, you know, just won't do. The others are hoping for Oscars here, too. Just look: Susan Hayward! You don't see her sorrow! If she's left out tonight -- well, she'll just cry tomorrow. Will he pout if folks thinnk that Paul Newman is outer? Relaxed, almost bored, as they sit waitiing there. You'd think this was Davis' "Catered Affair." He's rooting, of course, for the film, "Lust for Life." Look at Holden: the evening's a picnic for him. Made the wide screen of "Bus Stop" appear even wider. So, Rock: don't be blue, and lose all your vigor. True, "Giant" was big -- but Jayne Mansfielf was bigger. And all those commandments, thanks to Goldwyn -- and God. But Tab: that's no cause to run home sad to mother. "Rainmaker," "Carousel," "Richard the III,"
Hold off, Piper, let all these folks, too, be heard..."
Bowed low to the crowd and returned to his seat. "No Oscars tonight!" A most shocking pronouncement! And screamed to the ceiling this single word: why? The reason? His answer was brutally frank. The judges had checked. Every ballot was blank! And so 'twas the scandal of year '56. Not a voter in town had gone out to the flicks. Don't let such a tragedy happen this year! So rise, movie-goers; arise and unite! 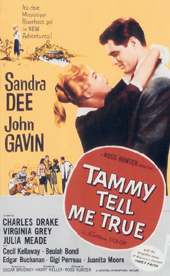 Start seeing your '56 movies tonight!